Exit 8 off I-20, proceed south to Fire Station 12 and turn right, making an immediate left on Woolworth, approximately 5 miles to the "T" at Colquitt, turn right approximately 100 yards & then left on Keithville Spring Ridge Road .8 mile. Turn right on Sparks Davis Road, .6 mi. to Cedar Hill Road to the sale site. 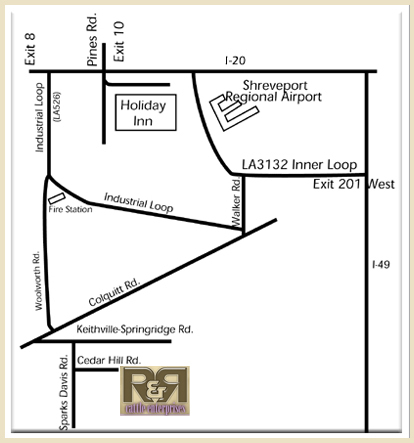 From I-49, exit 201 LA3132-West (Inner loop) 4 miles to exit 3, Walker Road. Go 1.4 miles, turn right onto Colquitt Road (LA525) and travel 6.6 miles to Keithville Spring Ridge Road and turn left .8 mi. Turn right on Sparks Davis Road, .6mi. to Cedar Hill Rd. to the sale site. If you would like to be added to our mailing list for future catalog mailings, please email us your information at springerron2@aol.com.